Three months of Bible readings based in the books of 2 Samuel and John. I thought you might be interested in this product. A series of puzzles and questions at the very end of the book offer a chance to look into other parts of the Bible not covered here. Table Talk is for families with children from 4 yrs and up to use for daily Bible times. Each day takes about five minutes, maybe at breakfast or after an evening meal. Choose whatever time suits you best as a family. 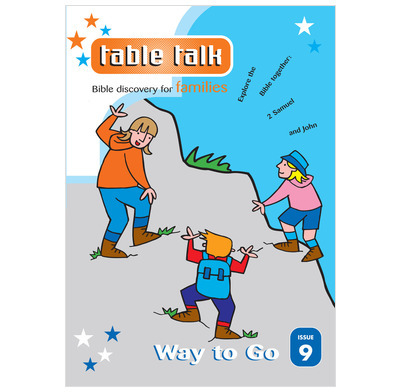 Table Talk links in with XTB Bible reading notes for children. (XTB stands for eXplore The Bible). The Bible passages are the same each day for Table Talk and XTB - so you can use the two books together, or on their own. Whichever suits you best. At last a daily bible study we can do together as a family! Just the right amount to do at the dinner or table, and everyone joins in rather than parents telling children. Mine are 8 and 10 years old and I see no reason we won't continue into their teen years Thank you so much for this great resource. Our 7 year old loves it "because we can read the bible together and learn new things live how to love God" Our 10 year old enjoys finding the bible passages and reading aloud. It really brings us together as a family. User friendly with great talking points, I would really recommend this to any family, especially those not used to reading the bible together. Our family is new to this series, but we are all benefiting from it! We have a 6.5yr old and a 4yr old who participate well when we spend this special time together. The 6.5yr old definitely gets more out of it than the 4yr old, but it's still interesting for her. We definitely recommend it!